Yesterday I received my business license from the city of Webster Groves. They had to run a background check on me to make sure I was worthy of a license. I guess the state and the county don't care - they just want my money. So now I have all the paper work I need to operate my publishing company. Going through this whole process has really made it clear to me that I need to publish more books in order to recoup the start-up costs of the publishing company alone. Last week I mailed off a copy of my book to the Library of Congress as required by them if you have a Library of Congress Control Number (LCCN) in your book. It is suggested that you obtain a LCCN if you think your book is one that will be carried by any libraries. I also had to send two copies of the book to the U.S. Copyright Office, which is necessary if you have applied for an official copyright for your book. Last Wednesday at the St. Louis Publishers Association meeting members were allowed to showcase their books to the attendees. I actually made two sales, which was awesome. 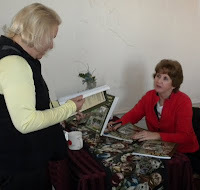 One of the purchasers is a realtor who is considering the book as a possible premium to give to customers. Fingers crossed on that one! There were about 15 vendors scattered throughout the house, and a civil war reenactment group had a tent pitched selling authentic reproduction civil war items on the front yard. You would think that alone would have stopped traffic on Manchester. Despite coverage in the local paper in the calendar section as well as a feature article (which would have been a perfect tie-in to my book, I might add) there was a very slow trickle of people coming through the house from 9-4. I did sell six books, which was pretty good considering the turnout, but more importantly met a librarian from Rock Hill and two ladies from Sappington House. Getting the word out about my book is critical at this point in time. Today the Webster Groves middle school held its annual holiday house tour, during which a boutique is held at Hixson from 1-5. Along with a great baked goods spread with coffee and tea put on by the moms, women selling their assorted wares lined the hallways. Unlike Saturday there was a lot of traffic through the building. However most of them were not there to shop but instead to listen to the live music and enjoy some refreshments. It was interesting to listen to the comments about my book title. A couple of people thought it was a book about bed and breakfast establishments (??? ), a few thought I was writing about the history of my house, and one thought it was about old houses in Webster. I had some explaining to do, but that is okay. The title grabs people's attention. The bottom line of the day, though, is that I only sold three books and I'm not sure I made any meaningful contacts. I can see I just won't be able to predict which venues hold the greatest promise for me. But I'm taking good notes for the future. I received a call around 11:15 today that my books were ready to be picked up at the printers. I dashed up there after a haircut and a quick stop at the local bookstore to see how their supply of my books was holding up. The owner thinks she has only sold one copy, but there is a big event going on Saturday and Sunday, so hopefully she will sell a few more. Anyway, once at the printers I immediately pulled a few books out of the box to examine. Due to my last experience, I stacked a few on a nearby shelf. And what do I see? Yep, the books are doing the wave thing again. Unbelievable! I talked to a couple of the employees, and they said they had never seen anything like it. I decided to hang around and wait for my salesman to show up to see what he would have to say for himself. He was definitely aware of my experience with the first printer, and thought that the problem I had there was with the way that printer had cut the paper. When Rick arrived he couldn't believe the way the books looked. (Again, I ask, where is the quality control?) He tried running the book again on 70 lb and 60 lb paper, with the same results. Then he tried both paper stocks on their color printer because apparently the paper feeds differently through a color printer. No luck... So what in the world is the problem? (Except for the fact that I have two book signings this weekend and no high quality books to sell.) I'm not sure, but it is obvious this printer can't fix it. Rick said he would sell me the books at his cost if I wanted them. I took him up on the offer. What else was I supposed to do?